Look at meeeeee………. Look at meeeeee………. Look at meee………..
… should I say “all-day song”…. 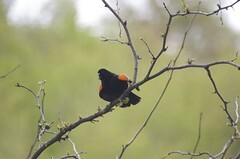 The Red-winged black birds have been outdoing themselves in the yard today singing their raspy songs.